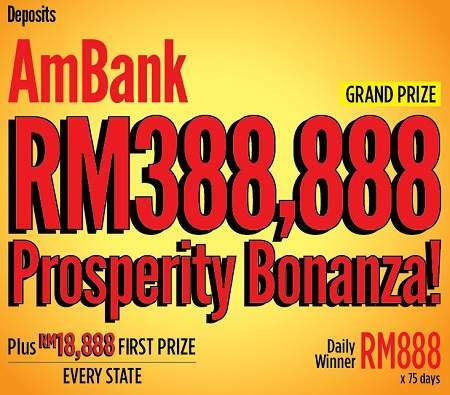 Home » cash » lucky draw » AmBank Prosperity Bonanza Contest : Wins RM388,888 Cash & more! AmBank Prosperity Bonanza Contest : Wins RM388,888 Cash & more! Fixed Deposit / Term Deposit : Every incremental of RM10,000 earns 1 entry. Existing Deposit Customer automatically earns 10 entries + 2 entries for every incremental deposit. Visit AmBank Prosperity Bonanza contest page for more details.